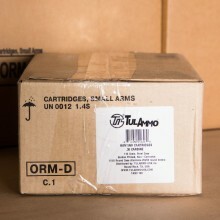 30 CARBINE AMMO IN BULK SHIPS FOR FREE FROM THE AMMOMAN! 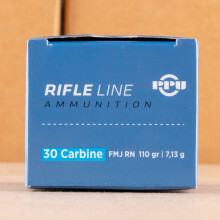 Developed as part of a light rifle initiative by the United States Armed Forces, 30 carbine ammunition offers increased power and more accurate shooting than the military's then standard-issue M1911 with a much lighter weight than a M1 Garand rifle. 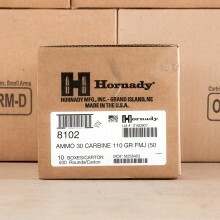 Modern shooters enjoy 30 carbine rounds chambered for both handguns and rifles. 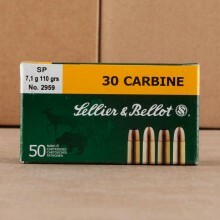 Generally used for range shooting; hunters have also found the rounds more than serviceable when looking to take down small and medium sized game up to the size of some deer. 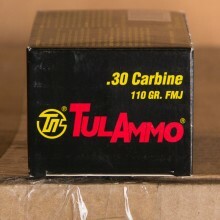 30 carbine ammo is a relatively light round that is generally found with a standard 110 grain full metal jacket (FMJ) bullet. Used in the M1 carbine, this round was developed for military personnel to carry that did not require the heavier M1 Garand rifle. M1 Carbines were never developed to be a soldier’s primary infantry weapon. 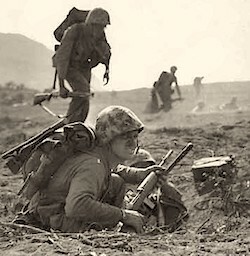 The photo to the right is a United States Marine carrying a M1 rifle chambered in 30 carbine at Iwo Jima in 1945. 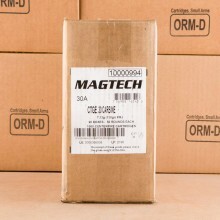 Today, you’ll typically find surplus 30 carbine ammo for sale in bulk quantities at a reasonable price. If you’re a hunter, you will want to look for 30 carbine jacketed hollow point (JHP) or soft point (SP) bullets to take to the field. Winchester, Federal, and Remington all make quality rounds in 30 carbine that are ideal for hunting purposes. 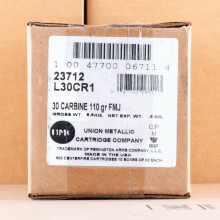 Ballistically speaking, the projectile of a 30 carbine round travels at about 2,000 feet per second, equating to about 970 foot pounds of muzzle energy when fired from an 18-inch barrel. There are also handguns chambered for 30 carbine. As you’d expect, the ballistic performance from these shorter-barreled pistols is much slower at about 1,300 feet per second. For comparison sake, the 357 Magnum caliber fires the same weight bullet from a four-inch barrel at about 1,500 feet per second. 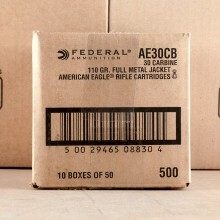 All bulk 30 carbine ammo is shipped for free at AmmoMan.com, you’ll get a secure package delivered right to your door ready for the range!